In a saucepan, melt butter over medium heat. Saute onion and leek until the vegetables take on a bit of color, about 5 minutes. Add potatoes. Cook for an additional 3 to 5 minutes, stirring frequently. Add greens, a pinch of salt and 3 cups water. Bring to a boil, then turn heat down to medium-low and simmer uncovered for 8 to 10 minutes. Remove from heat and let cool slightly. Working in batches, pass soup through a food mill or puree in a blender. Return soup to pot and simmer for 3 to 5 minutes to let flavors blend. Check seasoning. Garnish with creme fraiche and chopped herbs, and serve at once. 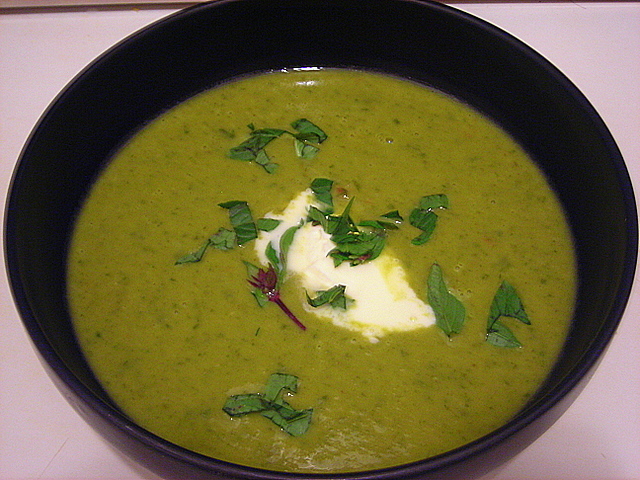 This soup is wonderful chilled and served as either a first course or a light entree. 25 Jul	This entry was published on July 25, 2008 at 1:59 am and is filed under food, general. Bookmark the permalink. Follow any comments here with the RSS feed for this post.